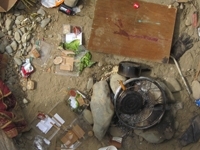 The need to reduce pollution in the river has brought the homeless situation to the forefront. Property owners in the riverbed will be faced with large fines for failure to meet trash reduction standards set for the Ventura River, much of which is caused by homeless encampments in the riverbed. At the April 24, Friends meeting, Rob Orth from Project Understanding gave a presentation on working with the homeless to bring them out of the riverbed. And on May 2, Peter Brown from the City of Ventura met with Friends representatives at the river to explain how he is working with Project Understanding & other organizations in conjunction with the Ventura police department to guide the homeless to available assistance and clear homeless encampments from the riverbed. Turning Point, the Salvation Army, & Project Understanding have joined forces in a project named “Homeless to Home.” The goal is to house as many of the homeless as possible. There are many obstacles to overcome as each homeless person in the riverbed has different issues to overcome to rejoin the community. Project Understanding works with one person at a time to address their issues and concerns. Taylor Ranch has made great strides in removing invasive Arundo donax (giant reed) from their property in the riverbed. And the County and City recently cleared arundo from their smaller properties along the lower Ventura River levee. The arundo grows so densely that it provides privacy between encampments in the riverbed. Removal of the arundo makes the riverbed much less inviting as a place to establish camp. Friends of the Ventura River continues to work toward the goal of creating a River Parkway, restoring native habitat, creating trails, picnic areas, and interpretive signs and other features so that members of the community can once again enjoy their river.